The above model is something I’ve been thinking about for a while – and would love to now think through with you – that aims to present some guide and scale for participation, with the goal of helping us know what level of participation to pitch for our communities or projects. Whether you’re building a social network, running a blog, doing an online campaign, cultivating a community, and so on, you must consider your levels of participation. This is when the mass market looks at your content, accessing it most likely through a search. In the same way we consult a brochure for information, people consult websites for information. This person is not part of your community and not a regular reader or participant. To provide a consult level of participation, you must focus on making it findable, and useable to first time visitors. The distinction between consult and consume is frequency. Consultations are few and far between, based on need. Consumption is regular, first based on interest and then based on ongoing usefulness and a certain degree of loyalty and trust. To provide a consume level of participation, you must provide regular content (whatever your content is) and make return visits easy by delivering to the door step. This is formalising a relationship by securing some kind of connection – creating an account, joining a newsletter, ‘liking’ a Facebook page or joining a group, using Twitter of Facebook to sign into a website. Less people do this than consume your content. I have about 3,000 unique visitors a month who consult or consume my content (50% are new visitors), but only 200 subscribers through connect Feedburner, of which 50 get my blog emailed daily. Connect is really about an exchange. I give you this, you give me that. This doesn’t have to be an email. It could be that I give you some of my photos, and in return, you showcase them on your website. I win because my work is online, you win because I tell all my friends to look at it. The trick is to make a win-win scenario. To provide a connect level of participation, provide ways for buy-in and exchange of data and other social connections, and demonstrate how they create a ‘win’ for the end user. One of the pillars of participation is competition. Since the beginning of time, the lure of competing (and winning) has generated the most participation – siblings know this well! On one level this is about building games – FarmVille‘s participation base is currently 20% of all Facebook’s users! Max Control is a competition that merges online and offline activity (disclaimer: they were a client.) Alder And Alder’s Advent Quiz competition was a great low-buy in game for busy people. On the other hand, this is about creating competition in things that aren’t games. The main motivation for getting Facebook friends a few years ago was a competition (“who has the most Facebook friends?”) In fact, Facebook used to even number your wall posts, so you could compete on who has had the most wall posts. When Ashton Kutcher reached 1 million Twitter followers, that was a competition. Even now, people compete over Twitter followers – if not with one another, then certainly with themselves! Gowalla, Foursquare and other location apps are competitions – “who is the mayor?” “how many items do you have?” “how many checkins have you made?” – the whole drive that makes Foursquare bigger than Gowalla in my opinion is that they made it more of a competition that Gowalla did. Even tagging, sharing and bookmarking can be a game. It’s a competition that you play against yourself. To provide a compete level of participation, just show a scoreboard and rank your users. That’ll create competition immediately. Most early adopters are in the habit of commenting, but if you think back to the first time you did, you’ll get an idea of where the early majority are. I remember thinking “why bother?”, which is what most of the early majority feel about this level of participation, which is why most don’t make it here. It’s a motivation issue. Commenting has reached a higher level of adoption inside Facebook, but even then it is done less, and by fewer people, than all the other levels. The reason why this is, is because commenting represents the shift from getting more to giving more. 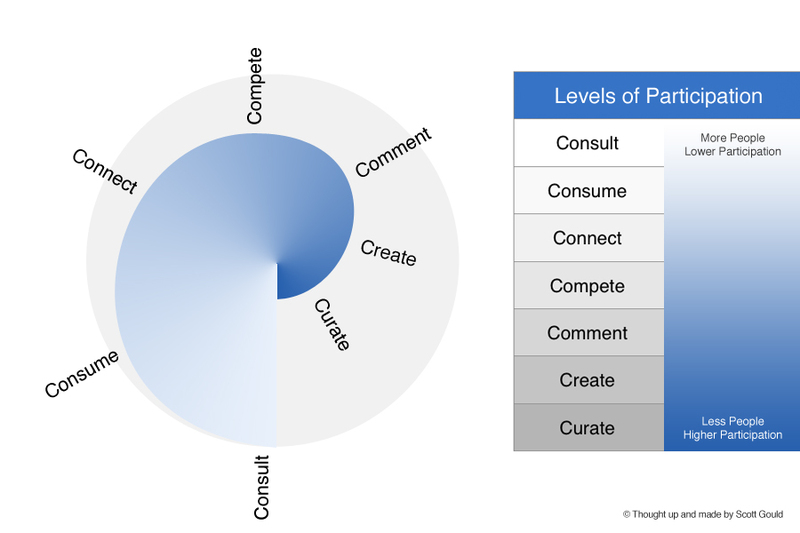 The other levels often give up front (consult and consume), or they give back immediately (connect and compete). Commenting however does not immediately give back, so the motivation has to come from a deeper level of investment and involvement. One of the issues here is that when someone wants to comment, they think that 1. they have nothing to add, and/or 2. there’s already conversation that they find intimidating and hard to break into. Example: Those who you see commenting in your Facebook stream are probably the same group of 50. In fact, those who comment on this blog are mostly the same people, who give very insightful and intelligible comments from a place of knowing me outside of this blog. It’s hard for a newbie to break into that! To provide a comment level of participation, provide a way for users to add their angle to the content (review, share, rate, etc) and attach getting to their giving – the more immediate and visible, the better. The user generate content realm is actually touched upon with compete and comment, because every action generates some kind of content as a by-product, however the create level is distinguished because the content is being intentionally and specifically created by the user. Forums are a memorable example for me – I used to write a wealth of information in then. Guest blogging, custom reviews, crowd-sourcing all tend to fall into this category. The motivation to participate at this level, I have found, is usually because of the benefit of identity the user gets by being associated. This has to be compelling in order for people to take time out and custom make content for you. To provide a create level of participation, show the identity benefits of association with your organisation, with examples of others who have done it. The highest level of participation goes beyond creating content to curating it, similar to the difference between a writer and an editor. The curator / editor knows the bigger picture well, and now nurtures the participants under them on behalf of the organisation. I’m drifting a little into metaphor and tech speak here, so let me paint a community example. With Like Minds, there are a number of people who help us at a very high level with bringing the event together. They not only have ‘ideas’ (which are a dime a dozen), but they talk closely with us and work through the kinks, whilst bringing the best of the ideas out there to our attention. I met one of these curators this week, where we spent an hour talking through the concepts and bigger picture repercussions of our next events. Key for me here is that these people are builders, not bulldozers. Curators build with you – the benefits of which are the intimacy they share with you, and the self actualisation they get. When I think of this level, I think of people like Robert Scoble who live and breathe the industry they are in and shape it by virtue of their grasp of the bigger picture, and being at the elbow of every conversation. These people are thermostats, not thermometers. They set the temperature and create culture. To provide a curate level of participation, be open and provide whatever they need to curate. They will rise to the top and show themselves to you as long as you do this. Pick one level, and use examples to agree or disagree. Hey Scott, I’m really keen to ‘participate’ in this discussion, but need some clarification. I’m not really understanding what you mean. Is it possible for you to ‘unfold’ this idea a little? I’m not sure what your try to say here, other than list types of interactions possible on sites, and the obvious fact that more people browse than participate. As an observational glossary for site interactions it’s nice, but it’s not very scientific. The ‘visualization’ appears to have no basis on any statistical analysis, esp as each of the types of interaction isn’t necessarily valid for all application/sites. A good start point, be nice to see where you take it. Yeah, the irony is that this article isn’t exactly too participatory itself! But I’ve had it in my mind for so long I had to get it down. What I mean is that as the level of participation goes up (from consult through to curate), the amount of participation required increases, and the number of people participating decreases because of this. So in other words, the lower the participation, the higher the volume, the higher the participation, the higher the value – right? Take this blog. about 200 unique people a day consult or consume it, but only 10 or so comment. So that’s the difference between level 1 and 2, and level 5. Totally – there’s no analysis herre. It’s a theory – and I hope people can bring some analysis, stats and examples to the table. And I still think it holds true. Most of the frameworks we go by aren’t strong on stats, but they make sense. Never read a stat in Seth Godin’s idea virus, but the framework keeps working for me, for instance. Also, as I’ve unfolded each level a little, what I am providing more than a list is ways to carry out that level. So someone can take this post, read it, and work out how to employ each level based on the directions I’ve given. So this is more than just observational – it is practically applicable. Scott, very thought provoking! After reading this, I was thinking about my business and which level of participation could help drive that the most. I’m more interested in quality than quantity. When I think about people that can help move the needle most, I think they are somewhere between ‘create’ and ‘curate’. When we’re able to influence people enough to “cultivate” and share the good news with their connections, you’ve hit a level of participation that helps fill the funnel for more to consume. Make sense? Interesting model you’re trying to develop, although some of the ideas have already been brought up. For example, the idea that for a group to be really interactive, it has to be kept relatively ‘small’, reminds me a lot to Malcolm Gladwell’s theory (in the Tipping Point) that the groups should be kept to a size of 150 people. After that size, people become strangers and don’t interact with each other so much, lets say (this is quite a general explanation..but I’m sure you’ve all read the tipping point anyway!). Dave – you’ve hit on what I’ve incinuated but not said – which is that it is a circle. The top end does indeed feed the bottom end. I too am more interested in value and quality, which is why with Like Minds we also have a high degree of people at the top end. It’s the same with this blog too. The trouble that we then have is getting the spread that we need. I have lots of depth, not much width – so that has to be addressed too. I think I’m getting it. Where does relevance fit into this? Where does accessibility fit in? Could it be that more people will feel compelled to participate with you if you become more accessible/relevant to them? For example, this post requires a certain amount of contextual understanding (of which I obviously have very little). Surely an increase in relevance/accessibility would increase participation? Why not have a situation where everyone participates (yes, somewhat idealistic – just to make the point). It may be that the model is skewed toward broadcasting (volume) rather than facilitating. Sure, for ‘one-size-fits-all- content, the degree of participation must surely decrease with increasing volume. It’s hit and miss – a numbers game. For a facilitative (value) approach, it’s up to the provider to make it easy for people to participate – compel them to want to interact. This is less of a numbers game, but relies much more on having a deep understanding of the audience at a micro and macro level. Something that few seem prepared to do. Sure – many of these ideas aren’t new, and I’m not saying that they are at all. I’m just putting down into a visual the way that I understand these things – which is what is “new” about this. Re: the Lift Conference – thanks for pointing it out – I’ll check it out. I’d probably suspect that out of the 1,000 people, there are levels of participation within it. Some people will just come along and not play a more participatory role at all – others are right in there curating the thing. What is certain though is that they have a tightness about their community in order to keep the vision tight. The 150 number isn’t a hard and fast rule. Military warfare has a high level of participation from tens of thousands! Thanks for the comment – I’m now following you on Twitter – looks like you’re in a similar space to me and Dave below! And I agree with you about the rule of 150, nothing is that black and white, I guess always depends on the context..
And finally, thanks for the follow on twitter! look forward to your comments and messages here on your blog! If so, and sorry for bringing Malcolm Gladwell again, but it does remind me a lot again to how the tipping point works… when you manage to reach say, level 7, then you’ve ‘tipped’ the point to reach level 1! By the way, related to this, I recently read a paper that shows how one learn more when is ‘the expert’, as opposed to just being listening, etc.. Interestingly enough, the paper shows 7 different levels of learning too. so you could add a 3rd column there, the less people, the higher the participation, and the higher the learning! So this model doesn’t factor relevance and accessibility – I think those come into play when it comes to how effective each level is. I don’t think this model is a broadcast model per se. The more people buy in, the more they participate, the less there are of them. From the many, to the few. From volume, to value. I mean thinking very much with technology here in mind too. Perhaps I’m not communicating it too well! What Dave means is how those who create or curate content are creating the content that the level 1 people will consult. It’s a content cycle, so to speak. You’re right – I’m trying to get the Cs. But I do think game theory is a competition. I certainly am playing a game all the time and competing with myself, if not others, when it comes to all this. You are communicating just fine. When intellectuals start talking they can forget that a blog post is not a end all be all piece, it is a post. To leave room for participation is part of a savvy strategy. I agree in that I have seen it over the past two years with the radio show blog. You spend lots of time creating something for your target audience to consume and while the numbers show they are reading it, the one willing to comment are FEW. Especially with the advent of the tweetmeme button, so now I receive RT not comments. Tony Robbins hit the nail on the head when we teaches about people and their inherit laziness to find the easy way through out life. So I take solace and watch as the way people connect – ie commenting vs tweeting morphs and changes. What about collaborate and compete instead of just compete? I think the interesting thing about many massive multiplayer online games (MMOs) is that they include competition like you’ve suggested with points, levels, badges and rewards. It’s clearly why some people play. What’s unique about many MMOs is that they also require collaboration as guilds (teams) problem solve together to meet the narrative’s goal. The goal cannot be completed alone and strategies and tactis require collective action. I guess you could say that out of all those who play MMOs, it is the ones who participate at level 7 that do the team work. Those who don’t participate at that level don’t do so well? I also think that a subtle theme of collaboration runs all the way through – hence it is not a level in itself. The higher the level of participation, the larger amount of collaboration that is going on, right? Thanks for the kind words. I’ve certainly found a lot of this to be true, even though the stats that we need here are missing. I think you’re right – water finds the quickest route. I also understand that I have to make room for the salmon who swim up stream too. interesting post Scott, and great comments as usual. I agree with Jeff that collaborate + compete is probably better than compete on its own: my only question is – is it at the right level? It seems more interactive and committed than “comment” to me: I am likely to spend more time on something if I am emotionally committed…. Thanks for the additions – I’ll investigate it more. It really is an idea, and like I said, I’m keen to get people’s feedback. thanks Scott. Arnstein’s ladder of participation is a) quite old, and b) a model for citizen involvement with government. I think yours is better suited for a P2P world, if anything. Keep on! You seem to have quite a collection of good solid frameworks building up: I’m liking it! Excellent post and very timely for me. I’ve been working my way through the execution to encourage interaction for a business online, and the framework you’ve presented here may end up being the centerpiece of how I articulate my strategy. Also, side note, love the MMO comments below – MMORPGs, the very first purpose-driven social media. Call it the sustainability of a well-architected social media platform. Martin I do agree – it’s not really for a P2P world. It’s funny, because Carl immediately sees government and I immediately see community. Hey – thank you for the comment, really appreciate the encouragement. Yup. I’m the 2X guest below. And Scott, you miss-quoted me on Twitter! As I said before, I’m working on a social media strategy for a social enterprise platform right now, and your post will be very helpful in articulating something that I was getting intuitively, but was still looking for a framework to articulate. I’ve been in renewable energy project development last few years, making a radical transition to online media ( go figure ), but one thing I learned is how few people recognize, or can architect, a truly sustainable solution. That’s my focus with my current gig – sustainable social impact. Hey Nate – glad to see your stuff is setup now. I’d love to meet some of these ‘intellectuals’! i think it is my former education training and hence I get so psyched about good charts or drawings when it comes to teaching, or maybe, because I am just a visual learner myself! Regardless, this is brilliant. I read through the comments as this ‘participation’ topic is close to my many selves (relax people, not suffering from multiple personality disorder): it is applicable for education consulting, project development consulting (legal and/or aid work), as a teacher, as someone who writes, as a blogger (yes, for me, the two are a tad different, albeit created with the same yarn). I am not sure how applicable my feedback will be for you and others…given I didn’t even know what the hell a SEO was until yesterday; I thought people were mistyping SEC (US Federal Agency: Security & Exchange Commission–a legal watchdog over transactions) so, definitely had no clue what a MMO was until I got here, apparently not short for a mammogram..
but I still wanted to share a few thoughts and you never know…sometimes those least familiar with a topic can equally add value, depending they have some experience, if not authority, in their background. If you see twitter (or other social media forums) as a reflection of our physical realm (doesn’t matter if you want to slice a conference room or any other type of engagement: board meetings, union meetings, classroom discussions etc.) then it goes something like this: there are people who bring new ideas, there are people who bring forth ideas completely OUT THERE that you wonder what they smoked before speaking, there are people who have thoughts on how to implement those ideas, there are people who disagree no matter what you say, there are people who are driven by ego so it doesn’t matter what they have to add as long as they are heard, and then there are people who do not have anything new to add yet they continue to yap, yap, and yap away. I know, how can someone like me who tries to cultivate a compassionate lifestyle be so cold. I will tell you why later. And then there are those who remain quiet and follow. Some because they don’t care, some because they are intimidated, some because they are intelligent and not driven by their egos and recognize they are don’t have anything new to add. Therefore, the above breakdown begs: WHAT constitutes as the desired participation and WHY. And in that case Robin said it rather succinctly: relevancy and accessibility. I am participating because this topic is very relevant to me on different levels. (Sidenote–often when people respond with some insight, be it in person or on a comment online it is helpful to the speaker as much as it is for the receiver. This is not the same as ‘thinking out loud.’ From a learning perspective, we conceptualize an idea from another and ourselves a step farther when meaningfully engaged). Another case in point. I went to this dude’s website that you mention. This Robert gentleman. Didn’t know who he was. No surprise there. Why would I. Or maybe a better question is: why should I? So, the sleuth researcher that I am, I browsed his posts. You may have picked up by my RTs on twitter that I am finding a certain joy in Facebook’s downfall and PR management. My RTs on twitter regarding Facebook’s demise are preceded by a (*snicker*) because I not only predicated this but I ‘see’ more cometh. Save that for later. Now, someone like me who RTs fakebook’s demise with a snicker to the extent that I might as well dedicate a separate blog to all the anti-fb links I have bookmarked, did not feel like participating in some very interesting posts that Mr. Thermostat had written about a topic I want to participate in. And here is why? My stance on facebook is beyond privacy concerns given I never did join facebook. But I also know that there are 93 comments on that post of his, so my slant is not going to have value, other than perhaps saying something someone has already said, that is if I took the time to go through all 93 comments! Or at best a mere acknowledgment from him of my comment. Where is the curation in that? There is no intimacy for my self actualization there because implicit in his tone is there is nothing to carry the momentum beyond something that effects social media…it reads like a glorified rant, better articulated than a baby rant of a newbie blogger. Another point: a fellow writer posted this short post about 5 reasons she hates Jane Austen, inspired by 3 tweets that we exchanged. So the post is dedicated to me. Neither one of us were expecting this but it has taken a life of its own. With over 54 comments from people discussion is Paulo Coelho like Dan Brown to what to make of Virginia Woolf if she likes Austen and you don’t. It’s rather interesting. But after 54 “intellectual/literary” comments, it will hit a plateau. So, great participation and discussion, and….what….next…. This brings me back to my original point about the types of participants we have given our human nature in any given setting. The object of participation then becomes to be driven towards something beyond the participation. So long as it’s not just retweeting Mashable links that’s a good thing too. Thank you first of all the comments and for sharing your insights – they are most valuable. If we take the example of Robert’s blog, my counter-argument would be that there is little chance someone can go straight to Level 7 – Curation, in one go. Becoming a curator takes time – and with the rights come responsibilities, right? Then if we look at your example on the Jane Austin post – we have a level 5 discussion – how then we do deeper those relationships, have people come back, and engage in more than just a blog post? That’s where I have two solutions, in my mind. As Robin says at the bottom of these comments, we must become facilitators of participation. Participation doesn’t just ‘happen’, and when it does, it needs to facilitated to create more of it. If you have a flick through those posts I’ve linked to, then let’s talk more – perhaps on Skype? Hi Scott. Thanks for the links. Will check out and then skype chat or talk sounds awesome later in the week. Great stuff, man. I am now using your blog as a reference point for helping others setup events. Heh.